When you're a villain in Gotham City, it is easy to get your hands dirty. With stealing money and making bombs you'll want to make sure your hands are protected from danger and from leaving fingerprints. That's where these purple Adult Joker Gloves come in handy. The joker is the most notorious rival the Dark Knight has ever faced and for good reason. He's got the best grip on the line between sanity and insanity in the biz, and that all starts with these handy accessories. When the Joker gets the urge to pull off a big job he grabs a pair of these gloves to make sure Batman won't get the upper hand. 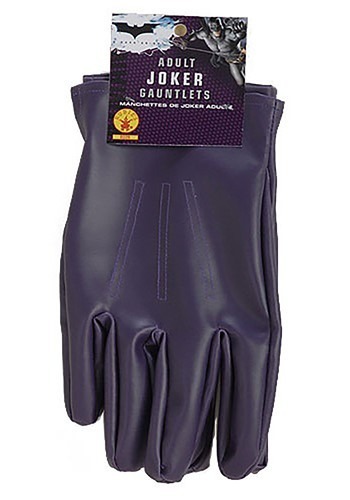 Add these devious gloves to your own Joker costume this Halloween and cause all sorts of chaos. Or take it easy, since it will be a holiday, and just have tons of fun clowning around on the dance floor!